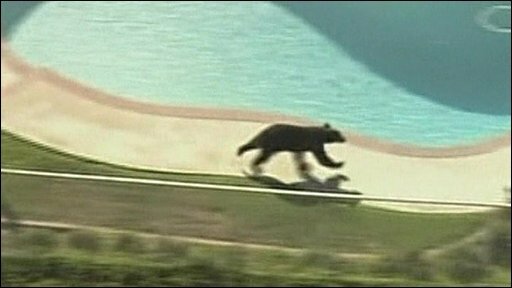 Authorities in Los Angeles, California have been contending with a wild bear that wandered into a residential area. Local news crews captured this aerial footage of the bear running free through residential gardens in the LA suburb of San Dimas, on Wednesday. Authorities shot at the bear with non-lethal rubber pellets in a bid to contain it, and it has since headed back into the wilderness.